When a title-less LeBron James abandoned an otherwise hopeless Cleveland sports fan base to play frat with his Class of 2003 buddies in Miami, America united in animosity. Disloyal, tone-deaf, selfish: this was your new King James. Never mind that, at the time, LeBron's worth crime was accepting a few throwback jerseys as gifts while still in high school. There is no rationalizing with someone pouring lighter fluid on their James memorabilia in the middle of the street. To reverse this breathtaking vilification, Team LeBron set out to remind us: the King is loyal--to his family, his teammates, and his friends back home. It was an enormous public relations effort, but the rebranding worked--not because a new character was created, but because it highlighted the pleasing parts of one that already exists. How can you malign the family man presented in those Samsung commercials? Or the regular guy riding his bike to work to avoid crazy traffic? Strategic PR moves, sure, but they seemed genuine, and perception is reality. The King's return to Cleveland a few years later, championship credibility in tow, added another feel-good element to the LeBron brand. After all, he never sold his house in Akron and kept in touch with high school teammates and coaches. His announcement in Sports Illustrated proclaimed "I'm coming home" to Northeast Ohio. Seemingly every commercial since has been about winning a title for beleaguered Cleveland. It's all about "getting one for The Land." The fans who once burned his jersey—having lived through four disastrous LeBron-free seasons—welcomed him back with open arms. The likable off-court image had been fully reclaimed. The funniest character in Trainwreck cared not about himself on the court, only about showing his younger teammates how to win a championship. Noble, indeed! 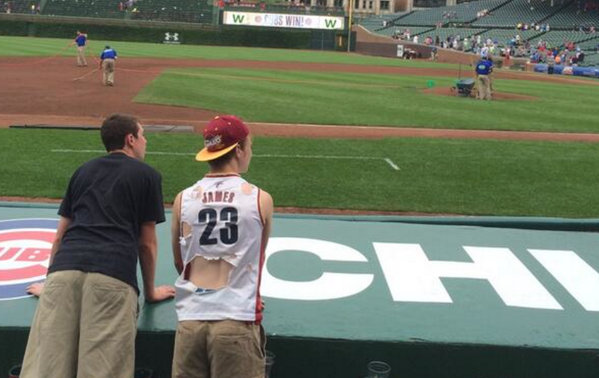 But the gold rings distracted us from another LeBron: the conniving, heartless killer of our own creation. This LeBron is a coach-ignorer, keen on throwing shade in the media rather than addressing issues in-house. He is the King we demanded after witnessing too many deferential passes at the end of close games. "He doesn't have what it takes," we said. "No killer instinct." Well, now he does. In more ways than one. The hints were always there. We knew the guy was a little petulant. We knew he didn't always give full effort. We knew Blatt would not have been his first choice of head coach. We ignore the unseemly traits, pushing them aside in favor of the feel-good story. Even when the Eastern Conference-leading Cavaliers suddenly fired Blatt this week, seven months removed from a Finals appearance and in the midst of an 11-2 stretch, some speculated he was merely a casualty of an unpredictable owner taking out frustration after a blowout loss to the champion Golden State Warriors. LeBron the Good Soldier would never go that far! As it turns out, Blatt "never stood a chance" the day the King returned. Open defiance during practices, secretive succession plots, sitting in Blatt's seat and venting to the top assistant—unbecoming behavior for the community-first, team-first good guy. We cheer when LeBron follows the rules of combat and decapitates his opponents. But when frustration boils over and he launches his sword at his boss, we're appalled by such behavior.